The Grass is Dead is growing again. The South Florida band has rearranged Grateful Dead songs in their own bluegrass style since forming in 1997 as a side project of the tribute band Crazy Fingers. With new members and a refreshed outlook, the act has reunited in 2015 and is touring more than ever. It performs at the Stage Stop in Rollinsville, April 20, as part of the 4:20 Fest, which also includes Manitou Springs-based Barrel House String Band. The band is currently comprised of Billy Gilmore on banjo, mandolin, fiddle, Dobro, guitar and vocals; Bubba Newton on bass; Brent Hopper on mandolin, guitar and vocals; Jack Schueler on guitar, mandolin and vocals; and Brittany Reilly on bass, guitar and vocals. All members have spent a lifetime making music including an extensive past with other popular Florida bands. Gilmore began playing banjo at age seven before learning guitar, mandolin, fiddle, Dobro, bass, and pedal steel. The vocalist, producer, arranger and multi instrumentalist, who is always looking to “spread a positive vibe,” has played in numerous projects and toured the world over the past 25 years. Newton, born and raised in Southern Maryland, moved to South Florida to make it his home in 1979. He played bass in various bands before forming “Crazy Fingers,” South Florida’s premier Grateful Dead tribute band in 1990. Hopper, who has played music since he could walk, left home on his 16th birthday to tour and perform with groups in South Florida including Crazy Fingers, Almost Acoustic Band and Cosmic Revolution. He left Florida in 2005 to began writing music and touring with his wife in the Brittany Reilly Band. Schueler, Originally from the suburbs of Chicago, has been playing regionally out of South Florida since 2006. He was the front man and songwriter for the jamband Cypress which disbanded in 2003. Since then, he has focused on acoustic music while fronting The Short Straw Pickers. 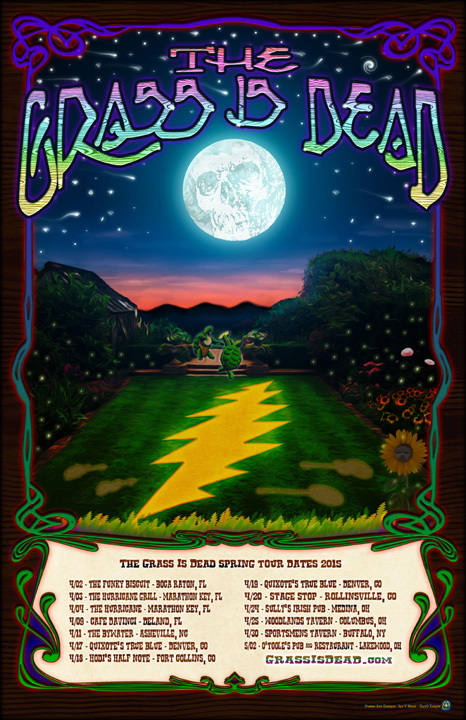 According to Reilly, The Grass is Dead—which has released three full-length albums including one offered by Grateful Dead Merchandising—has experienced numerous changes this year. After losing guitar player and founding member Corey Dwyer last spring, remaining members found “renewed energy in carrying on something sacred that was started back in ’98 with him.” Each of the members continued to play with different lineups, but the band’s other three original members have not played together under the name The Grass is Dead since 2005. The band has also embraced new members Schueler and Reilly, who calls the group “an ambitious lineup” since two members live in Florida, one in Colorado and two more in Ohio. As far as bluegrass goes, Reilly says she has listened to honky tonk as long as she can remember and Newton has “listened to it his whole life.” Hopper’s mom “had him listening to fiddles and country music at a very young age” while Schueler has roots in pickin’ guitars and writing music that pulls from bluegrass, old time and country. Gilmore, however, is responsible for the majority of the band’s bluegrass arrangements and is an “absolute genius, whether it be composition, mixing sound, or playing any of the eight or so instruments that he picks on almost flawlessly,” Reilly said. To learn more about The Grass is Dead, visit grassisdead.com. The band performs at Quixote’s True Blue in Denver on April 17 and 19, Hodi’s Half Note in Fort Collins on April and Stage Stop in Rollinsville for 4:20 Fest on April 20. Visit stagestoprollinsville.com for more information about the 4:20 Fest. Tags: 4:20 Fest, Barrel House String Band, Billy Gilmore, Crazy Fingers, Rollinsville, Stage Stop, The Grass is Dead. Bookmark the permalink.